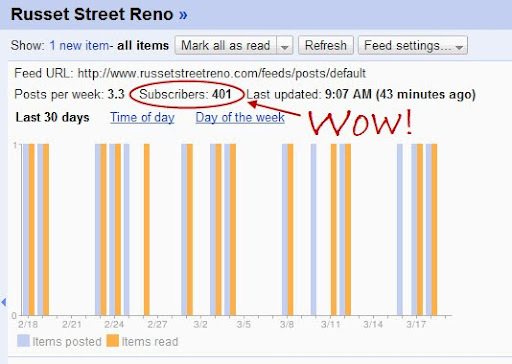 I checked out my stats on Google reader today, and I made it to 400 subscribers! Thanks to everyone who is subscribed, and especially those who leave me comments, you help keep me motivated when I can't possibly pick up another paintbrush! I hope you all have a wonderful weekend. wahoo! i love reading your posts. you always bring such a fresh, funny perspective to your projects, it makes for a good time watching you tackle things. dumb question: how do you see that screen? is that a google analytics thing? Woo hoo, congrats! Just found you today, your comment was above me on the blog featured from Uncommon Slice. Glad to see another Midwesterner and one who starts projects and doesn't finish them, haha! Your posts are hilarious and I feel like I can relate to so much of what you say with our home reno... following you! I love your humor in your posts! And you do a great job in the house! Congrats! Congrats! I'm always excited when I see that you've posted something new. It is no surprise at all that you have this kind of following. Your content is original, you aren't afraid to admit that you aren't perfect, and you don't take yourself too seriously. The design blogsphere is full of blogs that post inspiration pictures and projects that come together perfectly and ahead of schedule. By the way, what does "items posted" vs. "items read" mean? Does that show how often your subscribers read your posts? If so, it looks like everyone is hanging on your every word! Kelly, when you click on your own blog in reader (or anyone else's for that matter) in the window to the right, there is a little button called 'show details' at the top, you just have to click that and there you go! Yay! Your blog is seriously inspiring and fun to read. Keep it up! Congrats! I had know idea how to find this info until your comment above. Very cool! Yay! Congrats, that's very exciting! Holy cow, nice work!! I only have 63 subscribers. Wah wah. Wow, that is amazing! It just proves what a great blog and house you have! Keep up the good work!